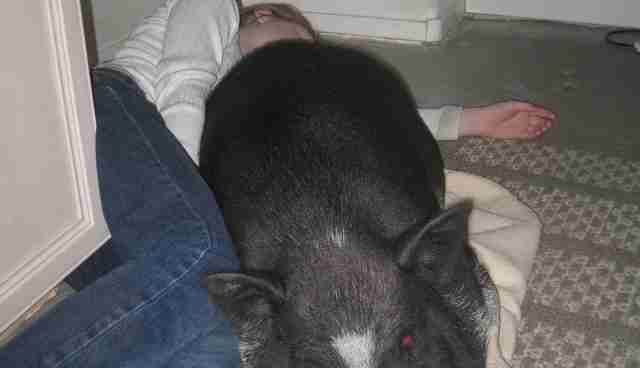 When Teresa* bought her "teacup" pig, Crispy, she never imagined that he'd grow so big that she'd need a new house to meet his needs. 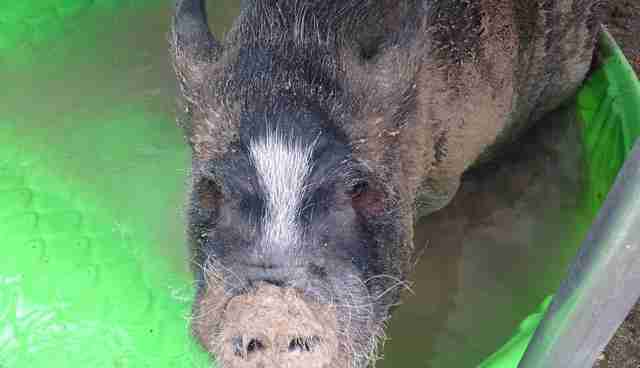 Like many others, Teresa was fed a series of lies about Crispy's size: Many breeders say the pigs will not exceed 20 to 25 pounds fully grown, when in reality these pigs may grow until they're 5 years old, and can easily reach 100 to 200 pounds - or more. Crispy on his arrival. Courtesy of Teresa. 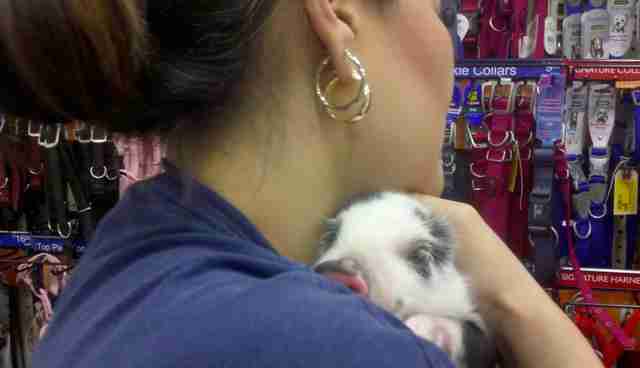 In 2011 Teresa fell in love with a piglet on a popular website that sells "teacup" pigs. She saw pictures of the piglet's dad, and felt confident that the dad was a "teacup" breed, so his piglet would be, too. "I really thought I did my research when I first thought about getting a pet pig," says Teresa. But looking at pictures now, Teresa "realize[s] how malnourished his father was." In other words, he wasn't "teacup" at all - likely just starved. 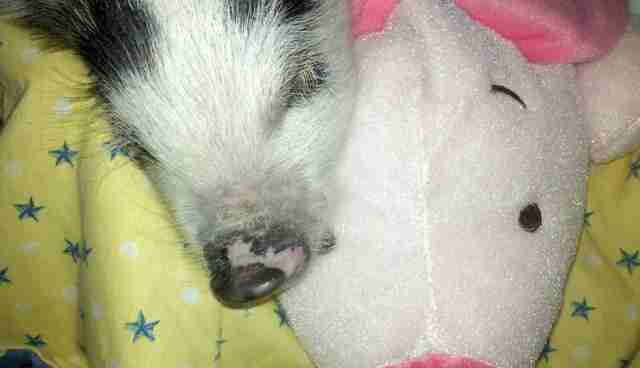 Crispy with his Piglet. Courtesy of Teresa. Soon enough Crispy started to gain weight. Lots of it. According to Teresa's research, she was feeding Crispy the right amount for his age, but when she contacted the website she'd purchased him from, she says they advised her to cut his food by more than half and continue to feed him their brand of pig food. Fortunately, Teresa had started to come across articles that cautioned against malnourishing pigs to keep them tiny artificially. It was then, she tells The Dodo, that "it didn't matter how big Crispy grew - I would still love him as much as I did the first day we picked him up." Crispy enjoying his patio. Courtesy of Teresa. While he was a mere 3 pounds at 6 weeks old, Crispy quickly gained 160 pounds - and he's been that size ever since he was around 2 years old. He was also a handful: Sometimes he would wake up at 3 in the morning and cry for a snack. Sometimes he would flip over furniture because he was so unexpectedly strong. Despite their best efforts to "piggy-proof the entire house," the family found that Crispy still knew how to get food out of the cabinets! But that didn't deter Teresa. Crispy stealing his dad's spot. Courtesy of Teresa. She and her family are so dedicated to Crispy that they decided to find a home with the space he needed to live outside in comfort. Teresa refused to move in until construction on Crispy's outdoor abode was finished - complete with air conditioning and a heater. Now, two years later, Teresa and her husband have plans to expand their house into his "so he doesn't feel like we have abandoned him." "Piggy-parenting," as Teresa calls it, is a much bigger responsibility than she and many other parents bargained for. She and her husband even "joke that [Crispy] is our first born!" Crispy basking in the water. Courtesy of Teresa. Ms. L* says her family bought its "teacup," Monte, in 2010 at the bequest of Ms. L's oldest daughter. She'd seen the movie "Uptown Girls" - which features a pet pig - "about 100 times." 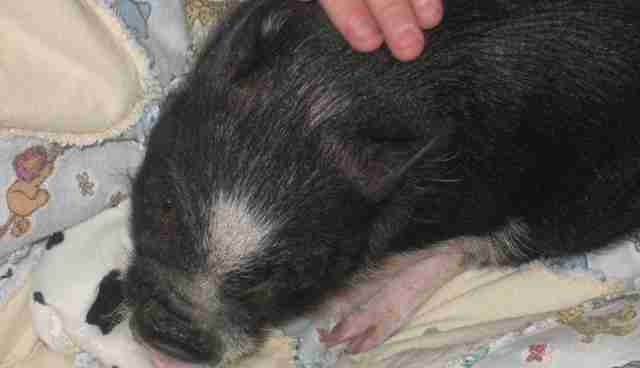 Monte as a wee piglet. Courtesy of Ms. L.
Ms. L's daughter and her other children earned $600 dollars, and they purchased Monte, Ms. L tells The Dodo. When they met him, he was the size of "a bag of sugar" - around 6 pounds. Now he tips the scales at 110 pounds. Monte cooling off. Courtesy of Ms. L.
Taking care of a "teacup" is a lot more work than people realize, Ms. L says. It's hard to locate a vet who's a pig expert, and it's difficult to find pet sitters when you go on vacation. Fortunately for Monte, Ms. L's middle child "fell head over heels," and is now his main caretaker: "Not only does she brush and bathe him, but she also earns the money for his hoof and tusk trim and shots!" Monte and his sister tuckered out. 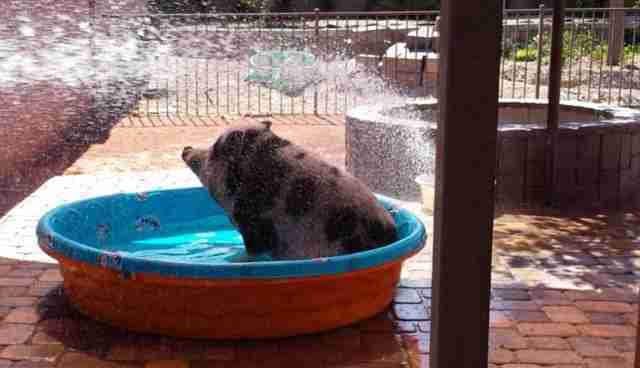 Courtesy of Ms. L.
Just like humans, pigs have their own personalities, likes and dislikes, idiosyncrasies and limits. Monte is no exception. "Even though he is a boy pig, we call him Princess Monte," Ms. L says. "He hates dirty warm water, his bed has to be just so, he has his own room, he hates to be dirty, he has his own fan and heater, he HATES to be cold, he loves to snuggle, he loves when others play the piano, and he is a picky eater." Monte toying with a teeny palm tree. Courtesy of Ms. L.
He also insists on eating at certain times each day - 7 a.m. and 5 p.m. - and goes to bed promptly at 8 p.m. What a stickler! Monte keeping cool in his very own bed. Courtesy of Ms. L.
Even though he's not what the family bargained for, Monte is still loved - despite the fact that he's gotten into "the cupboards and pulled things out, including cereal and flour (he made a HUGE mess)," or has gotten so smart that he's managed to turn the faucet on and flood the downstairs. He's also an escape artist who doesn't mind going out for a walk in the park - much to the chagrin of his concerned family. 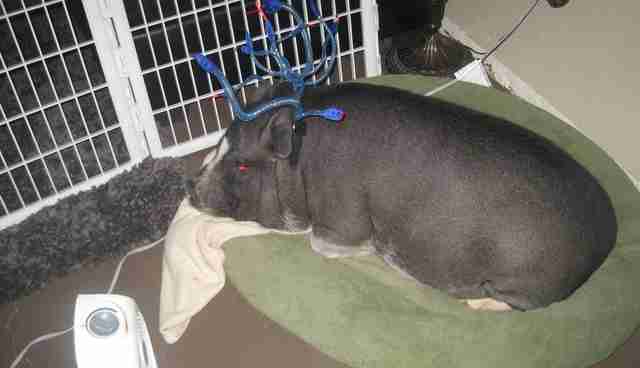 But Monte also joins in on family shenanigans, like when they bring him trick-or-treating on Halloween, take him out for walks and celebrate his birthday with hats and a special pig cake. 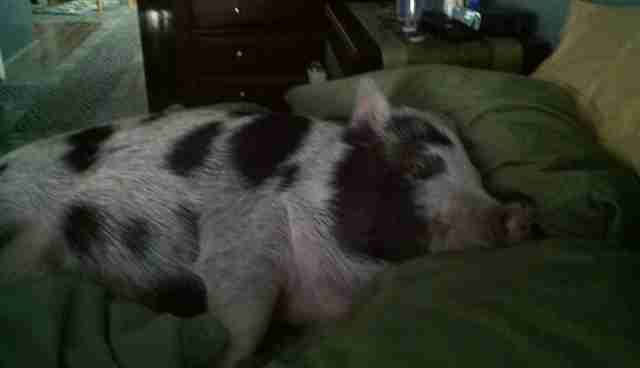 What a spoiled pig! 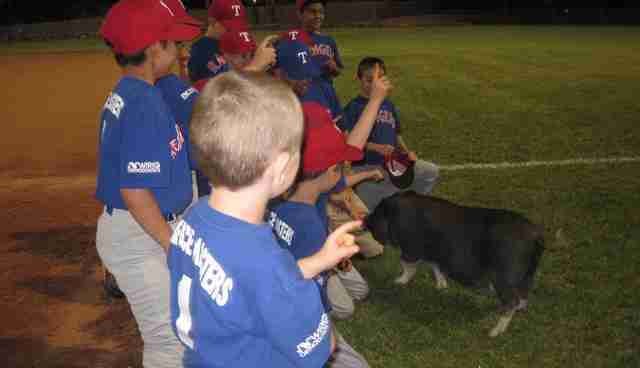 Monte on the baseball field. 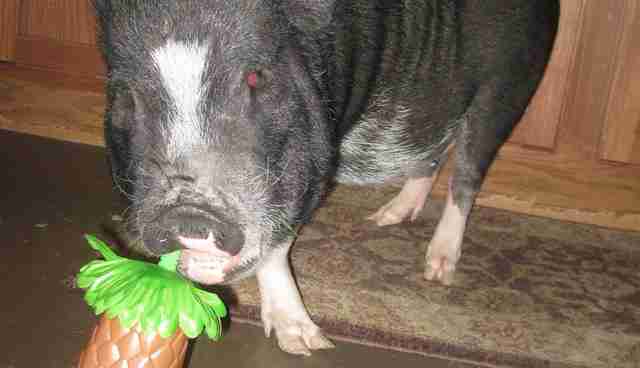 Courtesy of Ms. L.
Not every "teacup" pig gets a forever family. Every year, hundreds of pigs are abandoned because their families didn't know what they were getting into. Awesome sanctuaries like Vegas Pig Pets, PIGS Animal Sanctuary, Pig Placement Network and many others around the country offer great information as well as the chance to adopt amazing pigs. If you don't have the resources but would still like to support pigs, donate some of your time or money to a nearby no-kill shelter! *Editor's note: Teresa and Ms. L asked not to be identified by their full names. 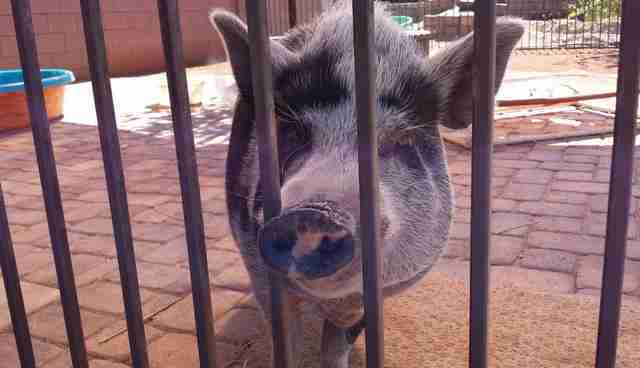 Pet pigs are illegal in some states, and they were concerned their pigs would be taken away from them.